Antibiotics used for treatment of severe bacterial infections have been shown to exert effects on the inflammatory response in addition to their antibacterial effects. The aim of the present study was to investigate whether the biological effects of endotoxin in a porcine model could be neutralized by tobramycin, and whether tobramycin or ceftazidime was able to modulate the inflammatory response. Thirteen piglets were subjected to endotoxin infusion at an initial rate of 4 μg/kg per hour, which was reduced to 1 μg/kg per hour after 30 min. Before endotoxin infusion, the animals received saline (n = 4), ceftazidime (n = 5), or tobramycin (n = 4) at clinically relevant doses. Physiological parameters were measured and blood samples were taken hourly for 6 hours for analysis of tumour necrosis factor-α, IL-6 and endotoxin concentrations. All of the animals exhibited physiological signs of severe sepsis without major differences between the groups. Plasma endotoxin concentration was stable after 1 hour. There were no differences in endotoxin concentration or initial tumour necrosis factor-α and IL-6 concentrations between the groups. At 6 hours the IL-6 concentration was significantly lower in the ceftazidime group than in the saline group (P < 0.05), and in both the ceftazidime and the tobramycin groups there were significantly greater reductions from peak values (P < 0.05). There was no neutralization of the biological effects of endotoxin in this porcine model. However, our data indicate a possible anti-inflammatory effect exerted by both ceftazidime and tobramycin, which manifested as a significantly greater reduction in IL-6 in comparison with the untreated group. Severe Gram-negative infections associated with shock still carry a high mortality rate in spite of appropriate antibiotic treatment and intensive care. Endotoxin, a component of the outer cell wall of Gram-negative bacteria, is a powerful inducer of the systemic inflammatory response that plays an important role in the pathogenesis of septic shock . Antibiotic treatment represents a key component of treatment for severe bacterial infection , but in addition to their antibacterial effect several antibiotics have been shown to exert effects on the inflammatory response. In numerous studies, both in vitro and in vivo, endotoxin in various amounts was released when Gram-negative bacteria were exposed to certain antibiotics, such as β-lactam antibiotics, which are commonly used for the treatment of severe sepsis [1–3]. On the other hand, aminoglycosides have been associated with low release of endotoxin [4, 5]. The mechanism underlying this effect of aminoglycosides is not clear but nonspecific binding and neutralization of endotoxin, similar to polymyxin B, have been proposed as the principal modes of action by some investigators [3, 4, 6]. In contrast to this, results from a recent study  showed that tobramycin did not neutralize endotoxin in vitro and that the effect was more probably due to a de facto low release of endotoxin. The absence of in vitro neutralization indicates that no aminoglycoside binding occurs that affects biological activity in the limulus amoebocyte lysate assay, but on the other hand a tobramycin binding that neutralizes the endotoxin effect in vivo cannot be excluded. Inhibition of the binding of endotoxin to lipopolysaccharide-binding protein (LBP), which is the most important carrier protein in the body and is crucial for attachment to the CD14 receptor on the macrophages, represents one possible mode of action. Another possibility is that binding with LBP is unaffected whereas the tobramycin–endotoxin–LBP complex has reduced affinity for the CD14 receptor or lower potential to elicit a signal via Toll-like receptor 4. The aim of the present study was to investigate whether the biological effects of endotoxin in a porcine in vivo model can be neutralized by addition of tobramycin. The primary endpoints were the tumour necrosis factor (TNF)-α and IL-6 responses after 1 and 2 hours, respectively, in relation to endotoxin concentrations. These time points were chosen because cytokine values obtained later might be influenced by an aminoglycoside-induced protection against oxidative injury, which has been demonstrated in vitro . Oxidative stress, which occurs mainly after maximal activation of neutrophils and establishment of shock , has been shown to induce a proinflammatory cytokine response [10, 11]. In several in vitro experiments similar oxygen radical protective effects have been shown for some of the β-lactam antibiotics , of which ceftazidime appears to be the most investigated . If this effect occurred in vivo, then it would influence the cytokine values during the last part of the experiment. Therefore, a secondary aim of the study was to investigate whether tobramycin and the β-lactam antibiotic ceftazidime could reduce cytokine concentrations at the end of the observation period. An additional secondary aim was to study the effect of tobramycin and ceftazidime on endotoxin-induced changes in haemodynamic parameters. The study included 13 domestic breed piglets of both sexes from different litters, weighing between 20 and 26 kg (median 24 kg). The animals were 12–14 weeks old and were without evidence of illness. Animals included in the study had an arterial oxygen tension greater than 10 kPa (75 mmHg) and a mean pulmonary artery pressure (MPAP) below 2.7 kPa (20 mmHg) at baseline, 20 min after completion of the preparatory procedure (see below). The Ethics Committee of Uppsala University, Sweden, approved the experiment. The piglets were treated according to the European Convention on Animal Care. Anaesthesia was induced with 6 mg/kg tilétamin-zolazepam (Zoletil forte vet™, Boehringer Ingelheim Vetmedica, Ingelheim, Germany), mixed with 2.2 mg/kg of xylazin (Rompun Vet™, Bayer, Leverkusen, Germany) and atropine 0.04 mg/kg (Atropin™, NM Pharma, Stockholm, Sweden). Anaesthesia was maintained by continuous infusion of sodium pentobarbital 8 mg/kg per hour (Pentobarbitalnatrium™, Apoteket, Umeå, Sweden), pancuronium bromide 0.26 mg/kg per hour (Pavulon™, Organon, Oss, The Netherlands) and morphine 0.48 mg/kg per hour (Pharmacia, Uppsala, Sweden) dissolved in a 2.5% glucose–electrolyte solution. During the experiment, sodium chloride infusion was given, resulting in a total fluid administration rate of 30 ml/kg per hour. A bolus dose of 20 mg morphine was given intravenously before performance of a tracheotomy, which was done in order to secure a free airway during the experiment and to administer nitrous oxide during surgical preparation. The animals were artificially ventilated throughout the experimental procedure (Servo 900C™, Siemens Elema, Stockholm, Sweden). During catheter insertions 30% oxygen in nitrous oxide was given. The gas mixture was switched to 30% oxygen in air during the rest of the experiment. The ventilation after preparation was set to yield an arterial carbon dioxide tension between 5.0 and 5.5 kPa. The respiratory rate was 25 breaths/min and the inspiratory–expiratory ratio was 1 : 3. Ventilator settings were then kept constant throughout the experiment. Atelectasis was prevented by placing the piglets into the prone position after preparatory procedures and by maintaining a positive end-expiratory pressure of 5 cmH2O . A central venous line and a 7 Fr Swan–Ganz catheter equipped with thermistor were inserted through the internal jugular vein into the superior caval vein and the pulmonary artery, respectively. In addition, a cervical artery was catheterized with an arterial line used for blood sampling and continuous measurement of arterial blood pressure. A minor vesicotomy was performed for placement of the urinary catheter and a heating pad (Operatherm 200W™, KanMed, Bromma, Sweden) was used to keep the animals at a constant body temperature. Once the preparatory procedure was completed, at least 20 min stabilization time was allowed to pass before baseline values were registered and baseline blood samples were taken before administration of antibiotics and endotoxin. All animals were subjected to endotoxin infusion (Escherichia coli O111:B4; Sigma Chemical, St. Louis, MO, USA) with an initial infusion rate of 4 μg/kg per hour. After 30 min the infusion rate was reduced to 1 μg/kg per hour, which was continued during the rest of the experiment. At least a twofold increase in MPAP (mmHg) was taken as a sign of severe endotoxaemic shock. This regimen was described previously [15, 16]. If the mean arterial pressure (MAP; mmHg) decreased to the level of the MPAP during the first hour of the experiment, then a single dose of 0.2 mg adrenaline was given intravenously. Values were registered hourly after baseline for 6 hours, after which all surviving piglets were killed by an intravenous overdose of potassium chloride. The animals were randomized using the sealed envelope method to receive tobramycin, ceftazidime, or saline solution. Tobramycin was given as an intravenous infusion of 140 mg in 100 ml saline solution for 20 min, starting 10 min before initiation of endotoxin infusion. Ceftazidime was injected as an intravenous bolus dose of 1 g in 10 ml saline 5 min before the start of endotoxin infusion, followed by 90 ml saline for a total infusion time of 10 min. In the control group an infusion of 100 ml saline was initiated 5 min before the start of endotoxin administration and was given for 10 min. The antibiotics were obtained as reference substances with known potencies. Ceftazidime was purchased from Glaxo Wellcome AB (Gothenburg, Sweden) and tobramycin from Eli Lilly Sweden AB (Stockholm, Sweden). The doses were calculated to achieve similar concentrations to those with commonly recommended maximal doses for treatment of clinical sepsis. MAP and MPAP were continuously monitored through the arterial and the Swan–Ganz catheters, respectively. The central line was used for injection of 10 ml cold saline for determining cardiac output (l/min). Cardiac output was expressed as cardiac index, and body surface area was calculated as weight0.67 × 0.112. Cardiac index was assessed hourly by the thermodilution method using the thermistor in the Swan–Ganz catheter. The average value from at least three serial measurements was registered. Heart rate was continuously monitored. Blood samples for analysis of endotoxin, TNF-α and IL-6 were drawn immediately before addition of antibiotics and hourly until the end of the experiment. At the same time points arterial blood gas and base deficit were analyzed (ABL™ 300, Radiometer, Brønhøj, Denmark). Endotoxin-free heparinized tubes (Endo Tube; Chromogenix AB, Mölndal, Sweden) were used for the endotoxin samples. Samples for TNF-α and IL-6 were drawn in EDTA tubes. After centrifugation the supernatants were transferred to endotoxin-free tubes and subsequently kept at -70°C until analysis. Analysis of endotoxin was performed in duplicate with the limulus amoebocyte lysate assay (Coatest™ Plasma Chromo-LAL; Charles River Endosafe, Charleston, SC, USA) . Commercial sandwich enzyme-linked immunosorbent assays were used for detection of IL-6 (Quantikine™ porcine IL-6, P6000; R&D Systems, Minneapolis, MN, USA) and TNF-α (KSC3012; Biosource International, Nivelles, Belgium). The TNF-α response at 1 hour and the IL-6 response at 2 hours were compared in the primary analyses of the immediate initial cytokine response. Because there was a variation in the immediate cytokine response, the reduction in concentrations of TNF-α and IL-6 from 1 hour and 2 hours, respectively, to 6 hours, as well as the concentrations at 6 hours, were considered late cytokine responses. In order to detect a difference in the initial log concentration of cytokines of at least 20% with an α error of 0.05, a β error of 0.2, a power of 0.8, and a calculated interindividual variation of 14%, eight evaluable animals were needed in each treatment group. In this exploratory trial an interim analysis was planned when there were at least four animals in each group that had survived for 6 hours. The distribution of the logarithm of initial cytokine response approximates the Normal distribution in this model, and was therefore analysed using an unpaired t-test. Other differences between treatment groups were calculated using the nonparametric Mann–Whitney U-test. The results are expressed as mean ± standard error or as median ± range. P < 0.05 was considered statistically significant. There were no significant differences in physiological baseline variables between the groups (Table 1). These values were all within the normal ranges . One pig in the ceftazidime group died 4 hours after the start of the experiment. At the interim analysis, it was concluded that intersubject variation was not greater than expected and that addition of further animals would not change the final result. Thus, the study was terminated when 13 pigs had been included. Values are expressed as mean ± standard error. Plasma TNF-α and IL-6 concentration values are shown in Tables 2 and 3. The plasma TNF-α levels reached peak values 1 hour after the start of endotoxin infusion, with a median value of 7265 ng/l (range 2492–10625 ng/l). There were no significant differences in peak TNF-α values between the treatment groups. 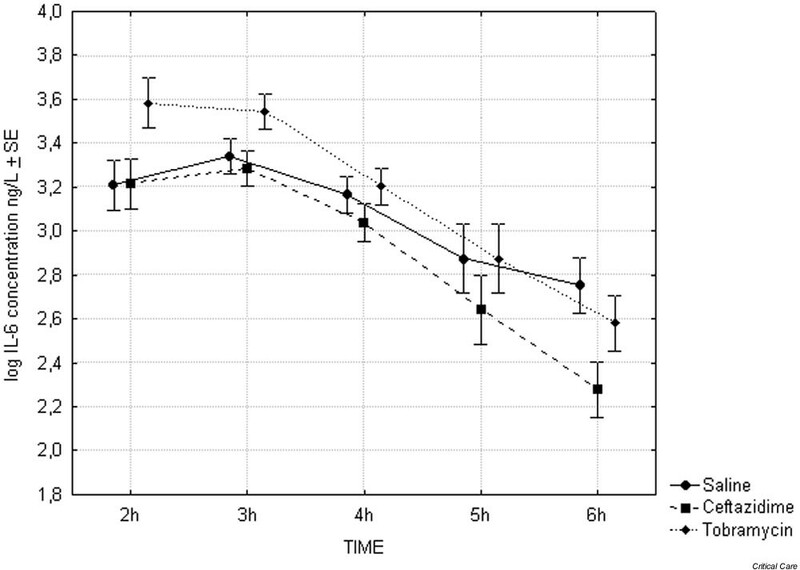 TNF-α concentration decreased to baseline levels within 3 hours in most animals (Fig. 1). There were no differences in the elimination rates between treatment groups or TNF-α concentration at 6 hours. Values are expressed as ng/l (median [range]). TNF, tumour necrosis factor. Values are expressed as ng/l (median [range]). Plasma tumour necrosis factor (TNF)-α concentrations 1–6 hours after start of endotoxin infusion (n = 4). SE, standard error. Plasma IL-6 levels peaked after 2 or 3 hours, with a median maximum IL-6 value of 2372 ng/l (range 1544–7138 ng/l). There were no significant differences in IL-6 concentration at 2 hours between treatment groups. At 6 hours the IL-6 concentration was significantly lower in the ceftazidime group than in the saline group (P < 0.05). Furthermore, the reduction in IL-6 seen both in the animals treated with ceftazdime and in those treated with tobramycin was significantly greater than that in the animals receiving saline (P < 0.05; Fig. 2). 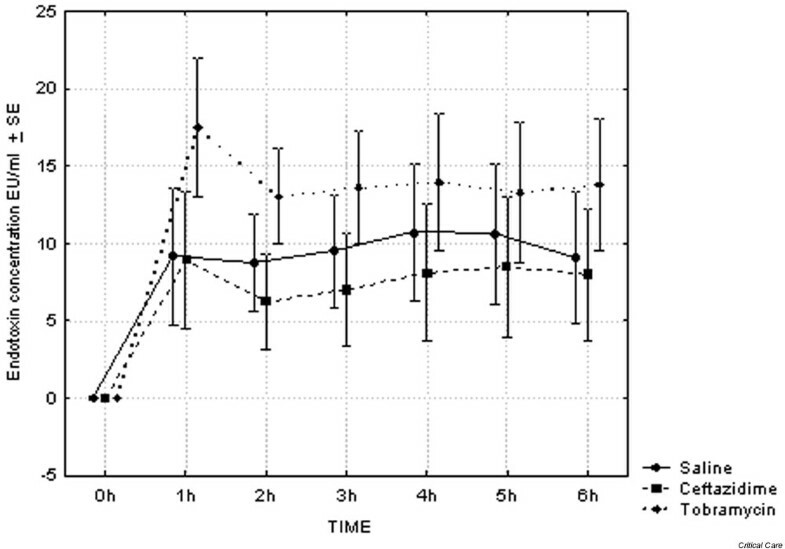 Plasma IL-6 concentrations 2–6 hours after start of endotoxin infusion (n = 4). Plasma endotoxin concentrations are shown in Fig. 3. The initial plasma samples obtained before the start of endotoxin infusion were taken after the preparatory procedure (i.e. vesicotomy and insertion of a central venous catheter through the skin), and therefore endotoxin contamination cannot be excluded. Despite this, plasma endotoxin was low (1.61 ± 0.47 endotoxin units/ml) in eight of the animals. However, in five animals – three in the tobramycin group and one from each of the other two groups – there were considerably higher levels (15.5 ± 2.9 EU/ml). In these animals there were no concomitant increases in TNF-α or IL-6 concentrations or signs of infection, and all of them responded physiologically to the endotoxin infusion with a doubling of the MPAP. In three animals – two in the tobramycin group and one in the saline group – there was even a decrease in endotoxin concentration after 1 hour of endotoxin infusion. Consequently, because contamination cannot be excluded in any of the samples, plasma concentration before the start of infusion was set to zero. Plasma endotoxin concentration during endotoxin infusion (4 μg/kg per hour during 30 min followed by 1 μg/kg per hour until the end of experiment). Time 0 = start of endotoxin infusion. The values obtained at time 0 have been set to zero. In the saline and the tobramycin groups n = 4. In the ceftazidime group n = 5 at 1, 2, 3 and 4 hours; thereafter n = 4. SE, standard error. As shown in Fig. 3, neither tobramycin nor ceftazidime had an endotoxin neutralizing effect in comparison with that conferred by saline. The endotoxin levels remained stable after 1 hour into the experiment. Physiologic variables are shown in Table 1. All pigs given endotoxin responded to this challenge with a marked rise in MPAP, and elevated levels persisted throughout the experiment. Cardiac index and arterial oxygen tension decreased, whereas base deficit increased and MAP showed minor variations in all three groups during endotoxin infusion. The neutrophil granulocyte counts showed a fourfold to sixfold decrease after the first hour, which was followed by a gradual increase (Table 1). At 6 hours the neutrophils were still substantially lower than baseline counts. There were no significant differences in circulatory, respiratory, or haematological variables between the groups. In the present porcine endotoxin model, the dose of endotoxin given was high enough to result in a hypodynamic septic shock. Recently, low-dose endotoxin animal models have been described that result in a hyperdynamic circulation that mimics more closely the circulatory changes that occur in human clinical sepsis . However, because the aim was to study neutralization of endotoxin and endotoxin-induced biological effects, a high-dose model was chosen in order to allow a relatively short observation time and to avoid low precision of measurements as a result of endotoxin levels that were too low. The initial TNF-α and IL-6 concentrations were chosen as primary end-points because endotoxin has been shown to induce a quick and reproducible response both in vitro and in animal models , and at 1 and 2 hours it is unlikely that any downstream effects will affect the result to any great extent. However, it must be pointed out that there may be a risk that this model will fail to exclude a possible antiendotoxin effect if endotoxin–aminoglycoside binding is subject to saturation kinetics and if a lower endotoxin dose is used. In order to minimise such a risk, the tobramycin dose chosen was at the upper end of the range used clinically. With four animals in each group the detectable difference is 25%, given the same power and α error. As shown in Tables 1 and 2, and in Figs 1 and 2, there was no tendency toward a reduction in the immediate cytokine response. This indicates that there is no in vivo neutralization of endotoxin-induced cytokine production, and consequently that there is no interaction with binding to LBP or the CD14 receptor. Furthermore, there was no neutralization of the circulating endotoxin, which is in agreement with in vitro results . In fact, there was a tendency for the endotoxin concentration in animals treated with tobramycin to be higher, which might be consistent with reduced binding to the CD14 receptor. However, the corresponding increase in IL-6 concentration and the unchanged TNF-α values strongly indicate that this was not the case. Although there is a need to confirm this result in a low-dose endotoxin model, our results indicate that there is no neutralization of endotoxin by tobramycin. As a consequence, the advantage of using an aminoglycoside for treatment of severe sepsis and septic shock may mainly be due to its broad antibacterial spectrum, to its rapid bactericidal effect, and possibly also to low endotoxin release per killed bacterium and inhibition of penicillin binding protein-3 induced endotoxin release . The inflammatory damage to endothelial cells and other tissue cells mediated by oxygen radicals induces cytokine production [9, 21]. In several in vitro experiments it has been demonstrated that ceftazidime and some of the other β-lactam antibiotics inactivate hypochlorous acid  and, in the case of ceftazidime, singlet oxygen . In clinically relevant concentrations, ceftazidime has also been shown to protect endothelial cells partly from the oxidative stress of activated neutrophils in vitro . The documentation for aminoglycosides is less extensive but both tobramycin and gentamicin have been shown to protect lung epithelial cells against myeloperoxidase-dependant oxidant injury by binding to anionic cell surfaces and neutralizing hypochlorous acid . These findings led to the hypothesis that the anti-inflammatory effects might affect the cytokine response during the last phase in our porcine model. At the end of the experiment, there was a treatment effect that was manifested as a significantly greater reduction in IL-6 by ceftazidime and tobramycin, and a lower absolute IL-6 level in the ceftazidime group, as compared with the placebo group. Because there are in vitro data indicating that ceftazidime directly affects neither IL-6 production  nor neutrophil function , this result might have been caused by its antioxidative properties. For tobramycin, in vitro data indicate that neutrophil function and oxidative metabolism might be influenced, but these results have not been reproduced in vivo . Whether our findings are due to antioxidative properties of the antibiotics or to other mechanisms cannot be concluded from the data presented, but the findings indicate that anti-inflammatory properties reported in vitro may be demonstrable in animal models also. With our short observation time, it was not possible to see whether this reduction was continued or whether it would have any impact on haemodynamic parameters. 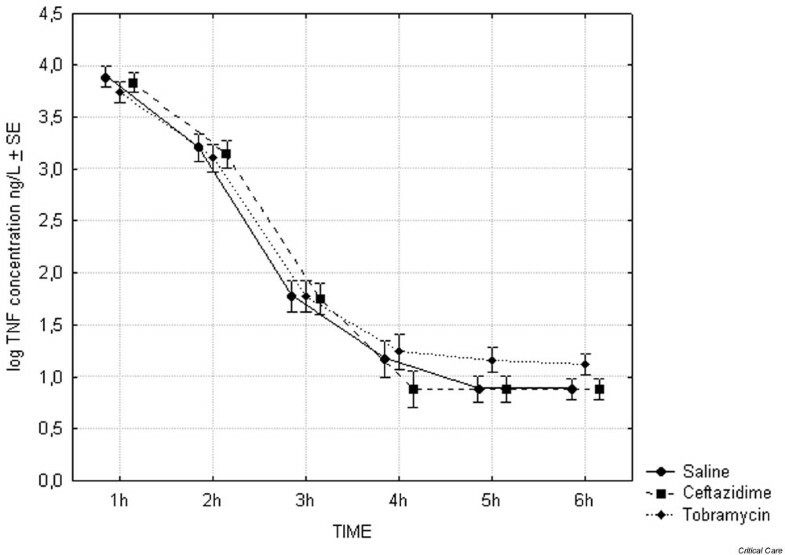 The biological effects of a 6 hour continuous infusion of endotoxin were not neutralized by tobramycin in this porcine model. However, data indicate a possible anti-inflammatory effect from both ceftazidime and tobramycin. The mechanisms, physiological consequences and potential clinical relevance of this finding need further investigation. This work was supported by grants from the Nielsen-Ohlinder foundation and from The Laerdal Foundation for Acute Medicine. The authors also wish to thank Anders Nordgren R.N. for excellent cooperation.